In India I folded Khadi paper and buried it in mud for days. When I unearthed the folded wads of paper I was enchanted to find that there were lines and tones etched into the surface by the action of the earth and water – and sometimes a worm had left evidence of its journey or a hearty meal. 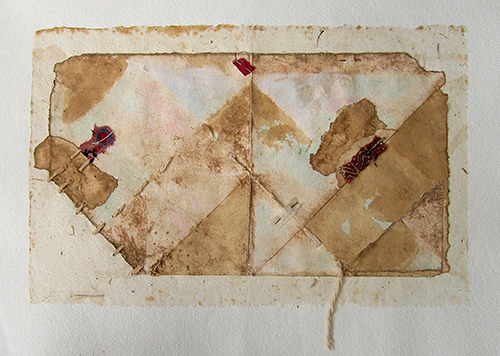 In the work above, this was just the beginning of my journey – there would be rubbing, collage and stitching added before the work reached its resolution. Playfulness is the dew-fresh, childlike spirit of wonder. A roving, wandering, wondering, “what if” kind of a rascal. It seems to me that the creative life is actually one big game of chance – whether one’s an artist in the studio or a gardener in the backyard, or a family-absorbed young mother. Chance rolls a situation under our feet; we meet it with open curiosity. We make a gesture, which chance plays with before serving us another … chance. There have been a few renegade artists who have made the use of chance a formal aspect of their work – in music composition and performance, in writing, and in visual art; I am particularly inspired by the work of John Cage. Influenced by his studies of Buddhism, Indian philosophy, and the I-Ching in the 1940s and 1950s, Cage incorporated “chance-controlled” elements into his ground-breaking work in all media, including watercolors, prints, drawings, and scores. but rather to imitate nature in her manner of operation. For Cage, nature’s “manner of operation” was purposeless play. Although he embraced randomness with the use of chance operations, he insisted that this “helped him make choices”, as the crucial ingredient in the process was finding the “right questions” in the first place. In the context of painting, for example, “What colour palette?” “What tools?” “What options for layout?” The painting below is the result of random composition dictated entirely by chance; the outcome is serenely contemplative. Maybe I am such a play-enthusiast because there was little allowance for it in my childhood years, when creativity was constrained by the need for productivity and usefulness – in other words, purposefulness. But there’s another reason: it was the best strategy I ever came upon as a teacher of art and design. Whether my students were working towards formal exams, or taking art subjects for the love of it, they all responded to the encouragement to play – and indeed, one of the enduring effects of playing with chance (they reported) was that they learned to find the right questions. And that’s a great life-skill, wouldn’t you agree? the brain stem of creative life. No play, no creative life. Be good, no creative life. Sit still, no creative life. The impulse to play is an instinct. the vastest intelligence cannot bring it about. Art is a verb and I believe arting ought to be included in the dictionary. For some it means arting is enough and sales are irrelevant. by creating just for the audience. rather than simply showcasing the finished product. Art is a verb. And in my experience, so is the artist. In fact, the self – in all its guises – is probably the busiest verb in the business. is where work and play merge. Image sourced from Pinterest; artist unknown.